I hope everyone is having a great weekend. It's been a warm but rainy weekend in central Ohio. I wore this outfit to lunch at my parents today. I had my eyes on this sweatshirt when the Neiman Marcus x Target collection first came out. I was super excited to find it on clearance in my local Target for a mere $8.99. It's super comfortable and easy to wear. This is my kind of outfit for the weekend. 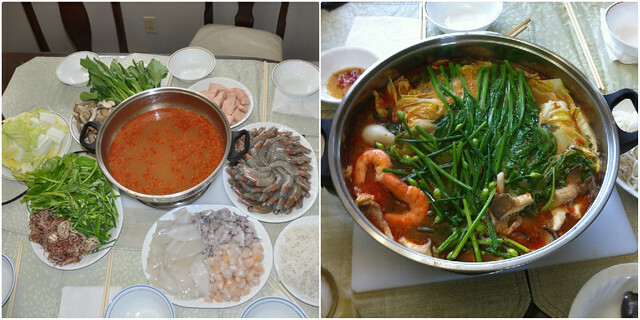 My Mom treated us today with the delicious hot-pot lunch. It was the perfect meal for a rainy day. The husband said I secretly enjoy visiting my Mom because of her cooking =) She has made our tummies very happy today! Easy but chic outfit. I looked for that sweatshirt but too late for my local targets! Too bad for me! I'm drooling over the hotpot!! Love the sweatshirt on you! yum! we had the same weather here, it was wonderful! Oh the hot pot looks perfect for a midwest winter. It's freeeeezing here in Minni. I love it when my mom treats me to hot pot too, yum! Love your sweatshirt, perfect for a casual weekend day! I love the sweatshirt on you. I've never had a hot pot like the one in your photo but it looks yummy! love hotpot! moms are the best! I love that bag!!!! I bought it for my mom last year. Cute sweatshirt and at a great price! That hot pot looks so good! Is that broth spicy? It look so flavorful. Moms cook so well. I'm not a good cook so I hope when my son gets older, he'll say something nice about my cooking as I try to improve over the next few or 10 years :). i have the same sweat shirt...isn't it super comfy! Thanks for tweeting about this sweatshirt, right after seeing it I was able to get the last one (thankfully an XS) at my Target :) And your vintage Coach looks like it's in really great condition. Did you do anything to clean it?